I came across a copy of the front page of the Evening Press some years ago in the Blackrock Market. A man had a stall selling real copies of newspaper front pages - he had the dates of papers that he had in stock. I was surprised to find he had a page from the Evening Press on the day I was born - 7th October, 1959. I bought it for £10 - the original price was 2d (two old pence) which is less than one euro cent now. Unfortunately, I only got the front page - I would have liked to have got the whole paper. The Evening Press is no longer published. 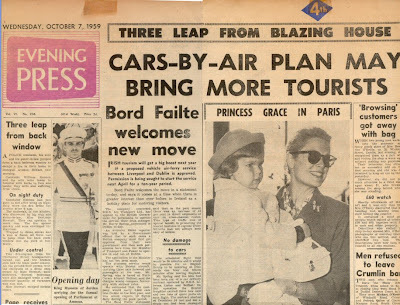 As you can see, the main headline was about an air-ferry service to fly cars to Liverpool from Dublin! Also pictured is the lovely Princess Grace of Monaco with her daughter Caroline - both beautiful women. The late King Hussein of Jordan also features. Page 2 contains a lot of small ads for jobs - many for teenage "boys" and "girls" to work as servants and shop assistants. Some wages given are 20 or 30 shillings per week (about 1 euro).